just reach home, and before the clock struck 12.
my girlfriend, IVAN CHEONG XIAN KANG! So yea, went out early morning to settle my course transfer thingy at UTAR. then, I went shopping for Kampar again. yea, & see what I got this time. I have this pink color fetish AGAIN, lately. I know right, I am hell so good in getting pretty & cheap things nowadays, why? because I am hell so broke now. Boss Edwin, bila you mau bayar gaji saya? 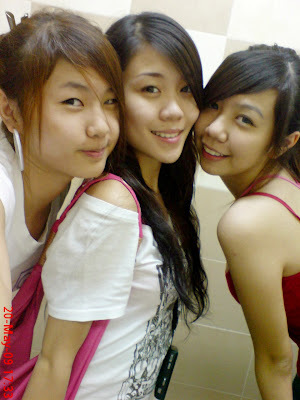 Then headed to AC together with adele, melissa & jiahui. Met up with Ivan there, birthday cake and birthday song singing session together with yeewei. Yes, adele and I got him a chocolate cake. fattening? yes, but Ivan, you definitely need some extra fats. Then, foos with Kin and Fred, the dragonball. Enjoyed, just so you know. adele, shinie & yours truly. Dinner at home, and it’s a great one, thanks mom. Right after dinner, I am out again, with michelle, shinyee, ivan, yeewei, jiashin and adele. Headed to Taipan Old Town, the Loklok stall kept seducing me, I failed to resist, & a stick of meatballs. p.s. – three birds on the tree, one is killed by the hunter, why one left and one still stay on the tree? one go report police ~!!! then one stay there to look after the scene and become the saksi ~!! because the bird is BLIND AND DEAF!! ah ~! and also happy birthday to ya friend ~!!! haha…. enjoy new life XDXD should be fun…. :PS: Because the bird scare till unable to move? u havent reply my sg laa,at gmail d..
~g~ – fuhh, not bad not bad, lame kaki! pretty and stunning? haha, guess he will be reading this. destiny – haha, then why the other one fly away? haha, one went to report police and another became the witness. huan – you make me LMAO. one went to report police and another became the witness la. lol. cindy – haha, i thought that period of mine is already over, anyway, you from s’pore? read your blog just now. jian aka miao – wth. this is damm lame lo. but the answer is one went to report police and another became the witness. lol. tianchad – probably because I am not stand out, and I couldn’t think of any to write. =( sad! janice – oh gosh! hahahaha. i cant stop laughing when I read your answer. is actually one went to report police and another became the witness la. jacky – haha.nono. one went to report police and another became the witness. ruki – sleep?!! lol. one went to report police and another became the witness la. adele – hello, i mixed too much with you, what to do? gerald – nono, birds also got law de k. one went to report police and another became the witness la. ai yer… your question so outdated. your new red sandal is soooooo cute.. just like you..
Hey where you got the laundry bag? I’ve been searching for it.